Malaysia, United Kingdom, United States, Canada, France...all others ETA Eligible Countries from our site. Your ETA Visa will be issued and sent to you via email within 15 Minutes. Registration & Login not necessary. Three simple steps to get your ETA/eVisitor Visa Instantly! We make it quick easy and simple to apply online for your Australian visa. No login or account creation necessary. Designed with Highest Security Level So You Can Pay with Total Peace of Mind. Convenient Payment. Check ETA Status of your Visa and download. We also send to you a confirmation email with visa approval. The Electronic Travel Authority (or ETA) is the name given to the most commonly used Australian Tourist Visa allows you to stay in Australia for up to 3 months on each arrival within 12 months from the date the visa was granted. An Electronic Travel Authority (ETA) provides authorization to travel to and enter Australia and is electronically linked to your passport. It is for short term stays for tourism or business visitor activities such as attending a conference, making business enquirers, or for contractual negotiations. The ETA Business Visa allows business people to visit Australia for work reasons for up to 3 months to conduct business. It operates on the same conditions each arrival within 12 months from the date the visa was granted. The Electronic Travel Authority is the name given to the most commonly used Australian Tourist Visa allows you to stay in Australia for up to 3 months on each arrival within 12 months from the date the visa was granted.An eVisitor visa is eligible for the citizens of the European Union countries who hold a valid passport of any of those countries. An Electronic Travel Authority provides authorization to travel to and enter Australia and is electronically linked to your passport. It is for short term stays for tourism or business Visitor activities such as attending a conference, making business enquirers, or for contractual negotiations. An eVisitor Visa is required for people who wish to come to Australia to travel or visit friends and family. The eVisitor Visa which allows individuals to visit Australia for business visitor purposes such as: attending a conference, negotiating or exploring business opportunities and stay in Australia for up to 3 months at a time within the 12 month time frame. We are not affiliated with the Australian Government website. 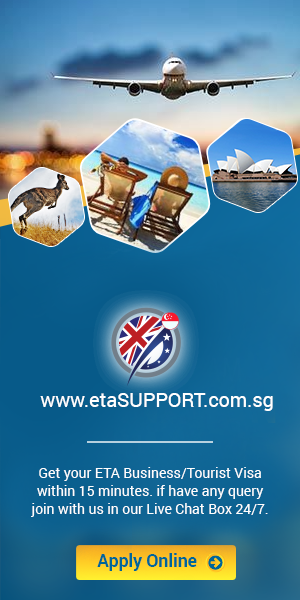 We are just ETA Visa assistance for processing the ETA Visa on behalf of them. The application form will be sent to the Australian government right away and helps you get ETA easy, hassles free, faster than ever. We always try to keep our website more secure, easy and multi functional for our valuable customer that's why we are different from others. Have a look below to know about ETA Support website features. We allow to apply for ETA/eVisitor Visa as Individual Application/Group of Applications under single transaction. We allow to Preview and Modify ETA/eVisitor Visa application all information before visa approve. We allow to check ETA/eVisitor Visa status and validity anytime from anywhere by using application reference number (free of cost). Before your visa expire we will notify you via email to renew your ETA/eVisitor Visa application for next 1 year. We allow inquiry to check ETA/eVisitor Visa status and validity who applied somewhere else (fees applicable). We allow to remove personal information from our website. if you don't want to keep your passport information in our system then you can remove your application. Need Australia Tourist or Business Visa? We ready here to help you make it easy and simple!